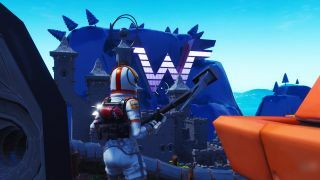 Today in Venn diagram circles I never expected to overlap, Weezer has its own official Creative Mode Island in Fortnite season 8. The island is a theme park with a bunch of challenges and minigames (maybe a bigger Weezer fan than I could tell you how they're related to the band) with tracks from Weezer's upcoming Black Album playing in the background. Basically, if Weezer staged a hostile takeover of the county fair and installed Rivers Cuomo as President For Life, this is probably what it would look and sound like. "Weezer World" is one of the featured islands right now, but aside from that, there isn't anything special to mark its official presence. It'd be pretty easy to pass right by the portal thinking somebody just gave their obstacle course a weird name. The band's official Twitter account confirms that it's in on the odd island cross-promo. Cuomo himself was teasing something Fortnite related a few weeks ago. Or maybe he was just tweeting weird stuff (as he is wont to do) which made Epic decide to reach out and make it a reality? Either way, between Weezer Island and doing that Africa cover, Weezer is quickly becoming the official band of doing stuff the internet is into. A week from now PUBG's gonna fire back with a brand new Maroon 5 map and chest tattoo skin, I'm calling it right now. Meanwhile, Apex Legends will probably just keep laughing at its own Mozambique memes. Suddenly feel like taking a break from building and battling? No problem, here are a bunch of games like Fortnite that you can try out instead.